Don Bluth's "Rock-a-Doodle" is finally coming to Blu-ray on October 31, 2017. Do we know if it'll be a combo pack with a DVD (I know the 2 websites you linked to don't mention it...are the Bluth film Blu-rays usually combo packs?)? My copy of Rock-A-Doodle on DVD is a flip-disc, with Pebble & the Penguin on the other side...flip discs aren't my favorite, but the only Blu-ray player we have is the XBox, which isn't what I usually watch movies on. Hello Amy! I have since purchased this set and I don't believe it is a combo pack. AV quality is average at best - I think bluray.com was a bit generous in its video rating. There were numerous times where I felt the print used for the transfer looked somewhat faded. Audio is serviceable. Also I believe it is Region A-locked. Those outside the USA will need a region-free player to access the disc's contents. If it's anything, Olive also released a DVD version. But if you're satisfied with what you have by all means then. Also, I'm hearing goings on the Olive master is PAL sourced (in other words, shorter running time and higher pitch due to PAL speedup). Is it *noticeable* when watching it? I can't buy anything right now, but it's definitely worth looking into- thank you! I’m afraid it is REINIER. The region-free Bluth discs from the USA are the ones released by MGM (NIMH, All Dogs, etc. ), 20th Century Fox (Thumbelina, Anastasia) or Universal (Land Before Time, American Tail, etc.). 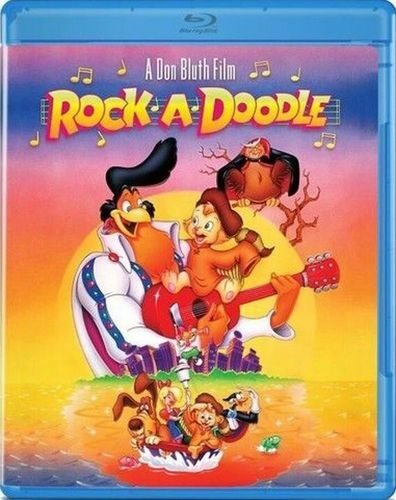 Rock-A-Doodle has been released by Olive Films, which is a rather obscure DVD and Blu-ray label. It is region locked. Why don’t you have a look at some inexpensive region-free blu-ray players online? I bought one from the UK last April and am having a blast watching titles I never could otherwise. I could finally purchase the GKids releases from the USA with confidence. Also, the new unit serves as an extra/backup player to my main blu-ray player in case that breaks down or needs servicing. Thanks Jules! I own such a player...but really prefer region free, if available...Thanks though...I might double dip on this one...If only for "Treasure hunting"..